Technology that scans and reads printed material to the blind is nothing new, but this personal reader is the first truly handheld device to do the job. 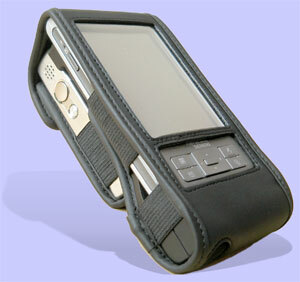 Combining a state-of-the-art digital camera with a powerful personal data assistant housed in a custom-designed, attractive case, the Kurzweil–National Federation of the Blind Reader puts the best available character recognition software together with text-to-speech conversion technology, all in the palm of your hand. Hold the Reader’s camera over print—a restaurant menu, directions, or a memo from your boss—and snap a picture. In seconds you can hear the contents of the printed document in clear synthetic speech. Scan, read, and discard pages; store them for later reading; or transfer to a computer or Braille-aware PDA. The Reader even has a headphone jack so you won’t disturb your neighbors. The Reader’s convenient size, simple design, and powerful technology deliver unprecedented access to printed matter. Imagine how the Reader will change your life. A colleague hands you a document for review in the next hour. No problem. You come back from vacation to an overflowing in-basket? Put the Reader to work, and the clutter is gone. Need to check your seat assignment in the airport? The information is a click away. You’ll find hundreds of uses for the Reader every day—all in one small package, and for less than you would pay for a notetaker or laptop. No other device in the history of adaptive technology for the blind has provided quicker access to more information than the Kurzweil National Federation of the Blind Reader. The world of the printed word is about to be opened to the blind in a way it has never been before. Get ready; the revolution can begin today. Freedom Scientific’s SARA™ (Scanning and Reading Appliance) is an affordable and easy-to-use solution for those who are blind or low-vision to read a wide variety of printed material including books, mail, newspapers, magazines, and so much more. SARA uses the latest in advanced optical character recognition (OCR) technology to scan text and then read it aloud in crisp, clear speech in a variety of voices and languages. You can start using SARA right out of the box, with no experience or training. Just place your book or document on the scanning area, and press the scan button. SARA automatically scans and recognizes the text, and reads it to you. During the reading, you can adjust the voice rate and volume, as well as fast forward and rewind, or pause and take time to examine a document in detail. You can even spell out words to get a better understanding of what is being spoken.